December 13, 2012 Pro-Muslim Brotherhood figure and head of the International Union of Muslim Scholars Yusuf al-Qaradawi called on Egyptians in his Friday sermon to boycott the electoral process in Egypt. ‘[Mohamed] Morsy is the ruler. He has to come back and agree with his brothers and all the people and nation on what to be done,’ Qaradawi said in a sermon he delivered at Omar Ibn al-Khattab Mosque in Qatar. ‘Oh rulers of Egypt, I swear to God you are oppressors and unjust killers. You killed people… who did not kill anyone and did not hold a stick or even a stone,’ he added. Oppressors came to Egypt after it was a safe reassured country that chose its president freely by a simple majority,’ Qaradawi said. ‘People chose Mohamed Morsy, then the most unjust oppressors came and claimed that the masses called on them to take over the government and expel Morsy,’ he added. Qaradawi accused the current regime of causing the killing and injury of thousands of people, and the academic year to be halted, leading to damage and ruin. 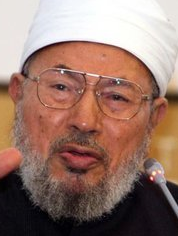 Qaradawi has been placed on a wanted list for airport arrivals by top prosecutor Hesham Barakat last September. He was charged with inciting the killing of protesters and Egyptian soldiers as well as inciting violence against state institutions and calling for foreign interference in Egypt, according to judicial sources. The GMBDW reported last week that Qaradawi had resigned his position from the governing council of Al-Azhar, one of the oldest educational institutions in the Islamic world. In July 2008, we reported that Global Muslim Brotherhood leader Qaradawi had been elected to the Al-Azhar Islamic Research Council. However, last month the GMBDW reported that senior Al-Azhar scholars had called for prosecuting the cleric for what they called “high treason. Youssef Qaradawi is the most important leader of the Global Muslim Brotherhood and is the de facto spiritual leader of the movement. He is also considered to be the “spiritual guide” for Hamas and his fatwas in support of suicide bombings against Israeli citizens were utilized by Hamas to justify their operations. In 2004, Qaradawi turned down the offer to head he Egyptian Brotherhood after the death of the Supreme Guide. He is based in Qatar and has said the Qatari Emir has protected from being designated as a terrorist by the U.S. He has also reportedly amassed substantial wealth by serving as the Shari’ah adviser to many important Islamic banks and funds. Qaradawi is the head of the Union of Good (UOG), a worldwide coalition of charities helping to raise funds for Hamas and is the leader of the European Council for Fatwa and Research (ECFR), the theological body of the European Muslim Brotherhood. MEMRI has produced two video compilations of Qaradawi’s extremist statements. The first collection contains Qaradawi’s statements about Europe and the US as well as about Israel and Jews. The second collection contains various statements by Qaradawi on social issues such as discussing the killing of homosexuals and stating that beating is “suitable” for some wives. Qaradawi been banned from entering the US since 1999 and UK since 2008. Last year, authorities also refused him entry into France. For a more extensive profile of Youssef Qaradawi, go here.